Want to meet one of Downtown Ithaca’s fun-loving business owners? 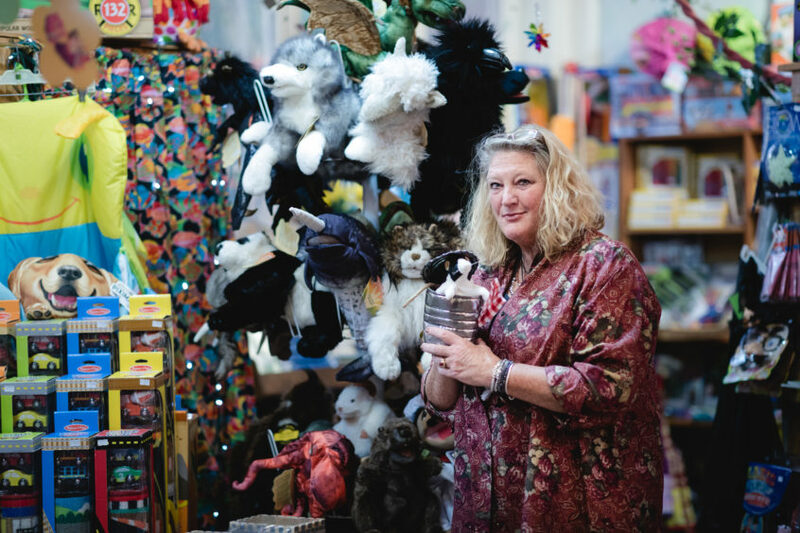 Look no further than Cat’s Pajamas, a baby’s and children’s toy store and clothing shop in the historic Dewitt Mall where you’ll find shopkeep Jennifer Engel likely entertaining youngsters. That’s because Cat’s Pajamas contains loads of amusing and entertaining kid-friendly merchandise including a grand selection of children’s books, games, plushies, puppets, classic and modern toys, name brand clothing and accessories, and more! Engel loves introducing children to the store and its interesting products. “A visit to Cat’s Pajamas is sure to put a smile on your face, and you’ll leave feeling more upbeat,” says Engel. During your visit, you’ll probably find Jennifer playing with at the shop’s train table or interacting with her customers in some other fun way, testing out the shop’s latest products (especially the costumes), reorganizing the stores inventory to create a new experience for her repeat customers, or simply partaking in a pleasant discussion with a fellow shopkeep or customer. For first time visitors, a great conversation starter is to ask her about the yearling buck that “visited” the store in 2012. 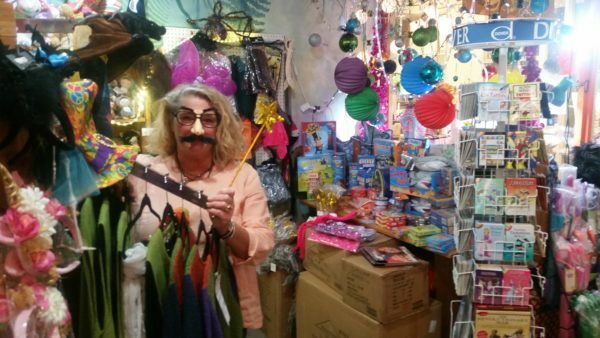 Engel has owned Cat’s Pajamas for nearly 40 years, and over those years, Cat’s Pajamas customers have grown up with the store a part of their lives. Engel almost didn’t end up as a shopkeep, though. Engel, a Ridgewood, New Jersey native, actually came to Ithaca to study linguistics at Cornell University. A short time after graduating for the Ivy League school, she was offered a position in the Translation Department at the United Nations. Just days before she was to hop on a flight to New York City, she had a change of heart. She decided Ithaca is her home and its where she’s meant to be. When Engel isn’t at Cat’s, you can find her either participating in community activities that have a connection to helping children and families or enjoying time with her own family. To learn more about Jennifer and Cat’s Pajamas, stop by the shop in the lower level of the Dewitt Mall at 215 N. Cayuga St. in downtown Ithaca. Cat’s Pajamas is open 10 a.m. – 5:30 p.m. Mondays through Fridays, 10 a.m. – 5 p.m. Saturdays, and 10 a.m. – 3 p.m. Sundays.